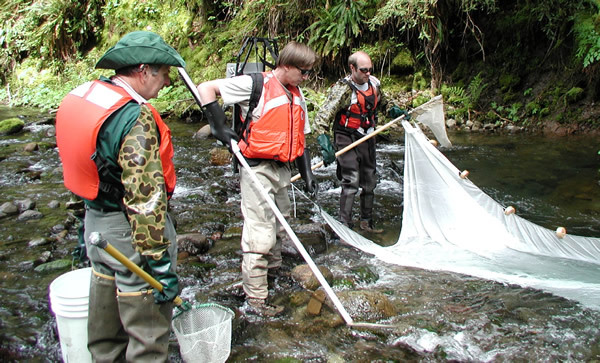 USGS scientists electrofishing on the Lookout Creek near the Blue River, OR. The fish they collected were analyzed for mercury content and added to the data base that the National Fish Mercury Model is based on. Many Federal, State, and other agencies monitor mercury levels in fish samples to identify streams and lakes susceptible to mercury contamination in fish, to assess trends over time, to determine the factors that make waterways susceptible to contamination, and to develop fish consumption advisories for mercury. These agencies face formidable challenges in interpreting data on mercury concentrations in fish tissue because important spatial and temporal trends in this data are often obscured by variations in fish sample characteristics -- different fish species, fish of different sizes, and/or different parts of fish (whole fish or fish fillet tissue). To help resource managers with this problem, U.S. Geological Survey (USGS) scientists have developed a national model of mercury concentrations in fish tissue. This statistical model can be used to analyze monitoring data and to predict mercury concentrations in single fish species, in a specified length, and/or in a type of fish tissue based on monitoring data containing the problems noted above. By accounting for differences in sample characteristics, the statistical model can reveal variations in fish-mercury concentrations between sites and over time that, otherwise, might go unnoticed. Additionally, the model can estimate mercury concentrations in many fish with very different characteristics, thus providing the potential to dramatically lower the number of fish samples needed for analysis (and therefore sampling costs) without decreasing accuracy. An example of an application of the model would be to predict the size and type of fish that will bioaccumulate mercury beyond a specific mercury concentration. The model is calibrated to a national data set of mercury in fish tissue (as of 2/05 there are 45,605 samples) compiled from various Federal, State and local data sets including the National Listing of Fish and Wildlife Advisory (NLFWA) data set. The model is available on-line and was developed in cooperation with the National Institute of Environmental Health Sciences and The National Map Program. In addition, the U.S. Environmental Protection Agency used the model in its development of the "Regulatory Impact Analysis of the Final Clean Air Mercury Rule" document. The document used predictions of mercury concentrations in fish-tissue across the Eastern U.S. from the model to estimate the benefit of reductions in mercury emissions from a variety of industries. Wente, S.P., 2004, A statistical model and national data set for partioning fish-tissue mercury concentration variation between spatiotemporal and sample characteristic effects: U.S. Geological Survey Scientific Investigations Report 2004-5199, 15 p.